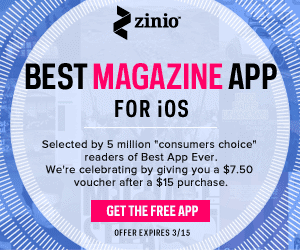 In collaboration with Zinio, I will be giving away 10 magazines subscriptions for free to the FIRST 10 readers who respond back to me! All you need to do is to download the award winning app from App store, provide me your first and last name, title of choice and your email address. Here are just a few sample titles : PC MAGAZINE, POPULAR SCIENCE, and MACLife. I would love to get Martha Stewart Living. If the offer is still valid i really want Computer Music Magazine (Future Publishing Ltd) subscription. Hi Alvin, thank you so much for doing this. Just got my voucher today. Thank you so much Alvin. are this Giveaway still on ? what a great giveaway and in Malaysia domain which is my country too. Do the giveaway still available? Hi, not sure whether your offer still stands. If it does, many thanks in advance. Mag title: The Simple Things. Apology everybody for the delay in getting back, the offer with Zinio had already ended. If they come up with another offer, i will make an offer again on my blog.